“All power in heaven and on earth has been given to me. Go, therefore, and make disciples of all nations, baptizing them in the name of the Father, and of the Son, and of the Holy Spirit, teaching them to observe all that I have commanded you. And behold, I am with you always, until the end of the age” Matthew 28:18-20 (Year B Gospel). The Trinity! The inner life of God! The Greatest Mystery of our Faith! We all are used to the idea that there is one God. And we fully accept that this one God is the Father, Son and Holy Spirit. On the surface, this seems like a contradiction. How can God be one and three at the same time? It’s a mystery that is worth penetrating and contemplating. 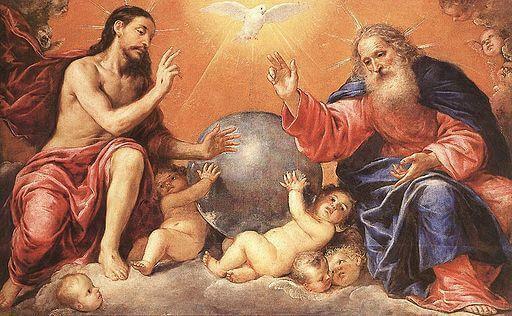 First, we need to understand that God the Father, Son and Holy Spirit are three divine Persons. Each one distinct from the other. Each Person has a perfect intellect and free will. Each one is capable of knowing and loving to a perfect degree. But it is this “perfection” of their ability to know and love that makes them one. They each share in the one divine nature and, within that divine nature, are perfectly united. This means that each one knows and loves the other perfectly. And that knowledge (an act of their perfect intellect) and love (an act of their perfect will) brings about a unity so profound and deep that they live and act as one God. What’s also inspiring to know and understand is that the unity they share by their mutual knowledge and love also offers each one of them perfect fulfillment as a Person. This shows that “personhood” is fulfilled by unity. What a wonderful lesson this is for each of us. We are not God, but we are made in God’s image and likeness. Therefore, we find fulfillment in the same way that God does. Specifically, we find fulfillment in life by our love of others and our freewill choice to enter into a knowledge of each person, forming a communion with them. This will take on different forms depending upon our relationships. Of course, husband and wife are called to share in the deepest unity in imitation of the life of God. But all relationships are called to share in God’s life in their own unique way. Reflect, today, as we celebrate this Trinity Sunday, on the relationships to which God has called you. How completely do you imitate the love of the Trinity in your relationships? Certainly we will all find areas in which to grow. Make a commitment to take another step deeper and, in that step of love, allow God to give you a greater fulfillment as a result. Father, Son and Holy Spirit, help me to know You and to love You. Help me to discover the love You share within Your own divine life. In that discovery, help me to also love others with Your heart. Father, Son and Holy Spirit, I trust in You.